Promising Arsenal midfielder Jack Wilshere has signed a professional contract with the club after turning 17 on New Year's Day. Wilshere is the youngest player to represent the club in the league and in European competition. At the club since the age of nine, he had previously been on a scholarship. "Jack is a player with great potential, with an ability to find the final ball and also score goals," manager Arsene Wenger told the Arsenal website. "Jack is a passionate and committed young player, he is not afraid of tackles and I am convinced he will have tremendous penetrative power in a few years. "We have already seen Jack's qualities in both his first team performances and in training on a regular basis, and we look forward to Jack being an important part of our first team for years to come." How highly do you rate Jack Wilshere? 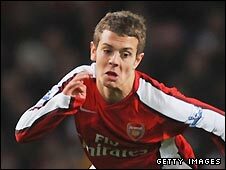 Wilshere made his Premier League debut against Blackburn as a substitute on 13 September 2008. He made his first start in the 6-0 Carling Cup victory over Sheffield United 10 days later, scoring his first senior goal for the club. The Hitchin-born player then made his Champions League debut as a substitute against Dynamo Kiev on 25 November.